Quickie: People Power in Tehran? Until 2 hours ago, Mir Hossein Mousavi’s Twitter page had updates. The Huffington Post also has an Iranian Election Twitter feeds page here. Persian Kiwi’s Twitter updates are here. The National Iranian American Council has some updates here including a report that Mousavi’s wife, Zahra Rahnavard, has made a public appearance calling for a national strike on Tuesday and a peaceful protest Monday in 20 cities across the country. 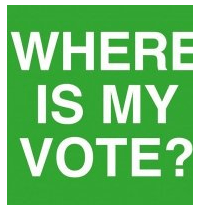 Meanwhile, in his Facebook page, some of MirHossein Mousavi’s 45,672 supporters have started sporting “Where is my vote?” in their FB profile. Great results. a great finish for TEAM AFSA 2009 and a long and worthwhile journey! As of late, yesterday evening the results are in, and will be officially declared as of this Monday. While the election committee still has a few issues to resolve, the basic fact is clear- the 2009 AFSA election is over. It’s important to note that while many bask in the glory of the results, one candidate who fancies himeself student of Churchill, let’s allow the days and weeks to play out out before declaring victory. Huh? Translation for people in pjs desperately needed, please.